Just a few notes on the OHP spectro party 2012: it was GREAT! thanks to everybody. A little announcement on the Nova Mon 2012. I wanted to remember however that keep following the nova is a really important key. This looks like a fast speed class nova, so spectral development will happen quite fast and in few weeks the magnitude will be to high to be observable with your instruments. 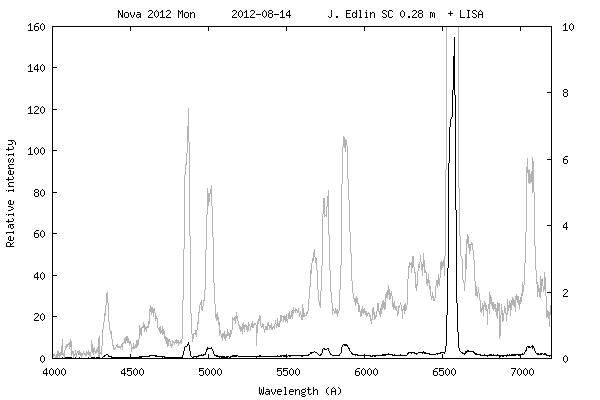 This motivation actually fits to all novae: they can change quite fast (nova Sgr 2012 #4 is an outstanding example of bizzare light curve behaviour - maybe dust formation is going on there) and one day spectrum can be (if you can get it, Jim knows what I am talking about) quite different from a spectrum you took a week earlier. We are talking about an historical nova: the first classical nova to be observed in gamma rays ( f.teyssier you were right and to be detected first in high-energy than optical. 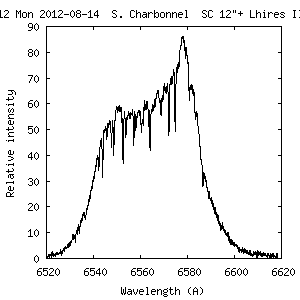 And, perhaps, one of the first to be validated as nova with amateurs data. Thanks again to everybody for your great and passionate work! "Time is an illusion. Lunchtime doubly so." - The Hitchhiker's Guide to the Galaxy, Douglas Adams, 1979.